The best known wild food dish is probably nettle soup. There’s actually quite a lot you can do with nettles, using them in the same way you’d use spinach (except of course for in a baby leaf salad – ouch). However nettle soup is still probably my favourite and I have it at least once a week at this time of year. To stop if from getting dull I do a few different variations which you can adjust according to your preferences. The classic nettle soup is essentially nettles, onion, garlic, stock, seasoning and a potato. Lightly fry the onion in a little olive oil, add the garlic, then the potato and stock and cook till the potato is tender. Add the nettles and cook for a couple of minutes to break down the stings, blend the whole thing up and voila. The potato makes it creamy and gives it a thicker consistency if you like a more substantial soup. What’s good about this recipe is that you can vary it quite a lot, adding lemon if you want something fresher or, my favourite on an early spring day when it’s still wee bit nippy out, chilli and rosemary. Nutmeg is also nice and you can use a can of cannellini beans to make the soup creamy instead of the potato. Lightly fry the leeks in the oil, add all the other ingredients, cook for just a couple of mins to break down the nettle stings, blend up and enjoy with a swirl of lemon cashew cream. Blend all the ingredients in a high powered blender adding the water until you reach the desired consistency, it’s better a little thicker than regular cream would be. Being a big fan of my nettles straight from the hedgerow as i wrote about here, I thought I’d try out a raw nettle soup, a bit like a nettle gazpacho, in order to keep all the nutrients in the nettles in their whole and vital state. I love this version, it so vibrant and energising, but it’s not to everyone’s taste… my hubby thinks it’s gross! All you have to do is blend together the following ingredients, pour into a bowl and serve. The speed and pressure of the blender will break down the nettle stings but make sure it’s blended completely smooth. When I fancy something a bit more substantial one of my favourite dinners is a nettle dahl. 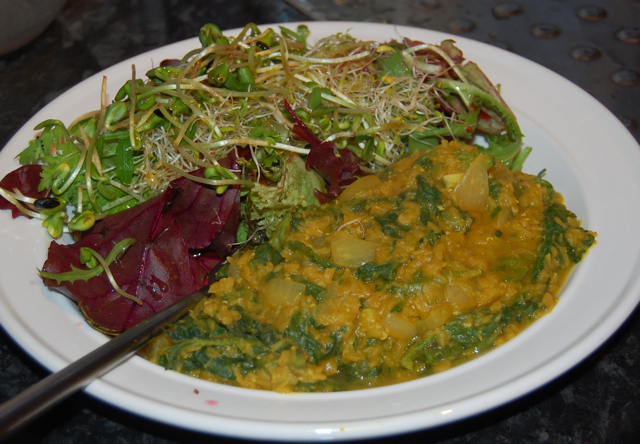 I just make a simple dahl with red lentils, spices, onion, garlic and ginger and add the nettles for the last couple of minutes of cooking time. In fact you can add nettles to many of your favourite curry dishes, it works really well and is just as delicious as spinach, chard or other greens. Happy foraging, I’d love to hear your favourite nettle soup recipe if you have one. 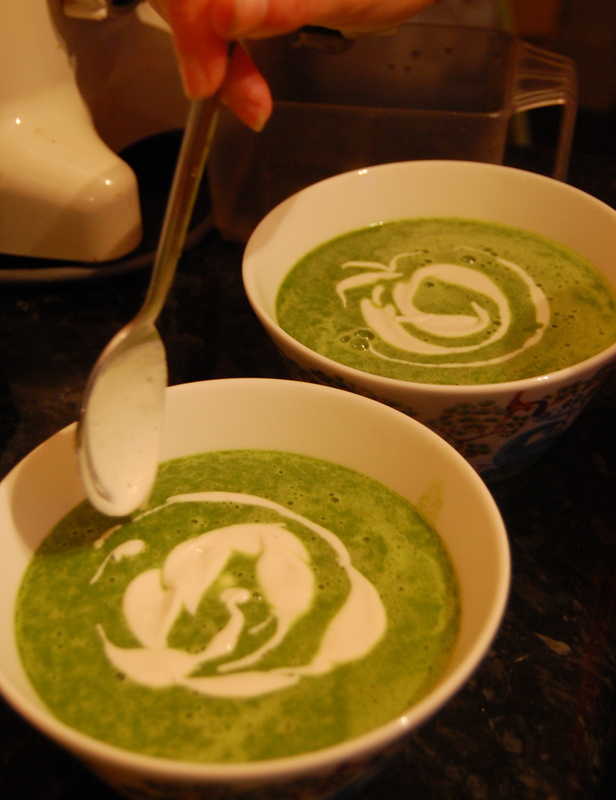 I served nettle and wild garlic soup to my family last year without telling them what it was (otherwise they may have turned their noses up at one of Mum’s weird concoctions). They absolutely loved it. 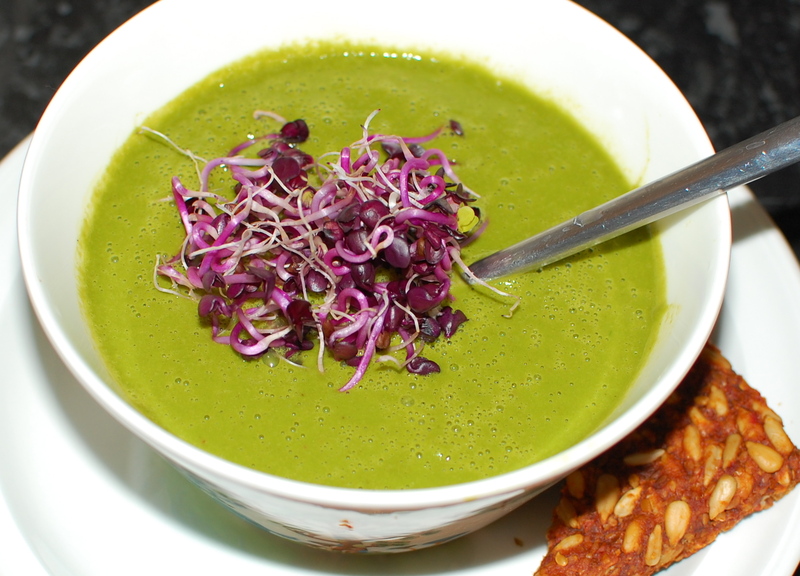 What are those purple sprouts… Looks so cool contrasted to the green soup! They were a type of red radish sprouts. Perhaps rose radish? I can’t quite remember now sorry! !